As coaches, our ability to be fully present and conscious with our clients is key to a successful relationship. It’s important to intentionally improve these skills and identify the bad habits that erode them. 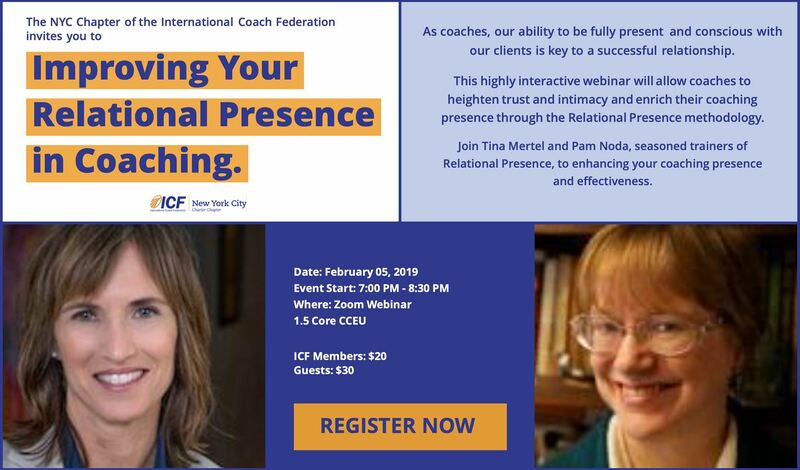 This ninety-minute, highly interactive webinar will equip coaches with the Relational Presence methodology. This proven process allows coaches to heighten trust and intimacy, enrich their coaching presence, deepen active listening, and fine tune their direct communication with their clients. Be prepared! This is a high participation webinar where attendees have the opportunity to practice the skills in live sessions. Bring your “camera look” and come ready to interact with the other participants via webcam. Facilitators Tina Mertel and Pam Noda are seasoned trainers of Relational Presence and regularly facilitate Relational Presence workshops both for the public and in organizations.